Description: Level: Product, process designers and managers, digital design and manufacturing engineers, industrial engineers, manufacturing and assembly system design engineers, quality control engineers, industrial designers, maintenance system design engineers and managers. Ideal for undergraduate / graduate education and research in product / process design, DFM , DFA, DFQ, (Design for Manufacturing, Assembly, Quality, Disassembly), Concurrent Engineering, PLM (Product Lifecycle Management), CAD / CAM, TQM, industrial engineering, industrial design, and others. 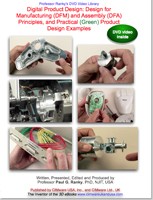 Several sections and cases could be used even for high school students and technicians learning/ exploring customer-focused product/process/assembly/disassembly/ maintenance service design challenges. Industrial Sponsors/ Contributors include with special thanks to Yamazaki Mazak, USA and Japan, Belkin Inc., Robonova Hitech, USA, Richard G. Ranky BS(Hons), CIMware Ltd. UK, CIMware USA, Inc., and others. Contents: Professional quality product/ process design engineering skills, besides a strong analytical, digital design and digital manufacturing / assembly engineering foundation, call for some basic and often very simple design rules. In this program Professor Ranky introduces, and to some extent illustrates several basic product design, process design, design for manufacturing / assembly, and other design rules with simple and practical mechanical and electro-mechanical product and process examples. In particular, the rules and principles discussed with examples include: design for manufacturing and assembly, disassembly, sustainable green product / process design issues, cost, the concept of designing components, modules, and systems that can be assembled, as well as disassembled, design parts for ease of fabrication, some multi-axes CNC machining principles, layered assembly principles, the principle of 'z' stacking for assembly / disassembly, modular design principles, some part handling issues, automated assembly challenges, and others. Disclaimer: please note, that all opinions expressed in this program are Paul G. Ranky's personal opinions, based on his own judgement, and have no reflections on any other party. System Requirements: DVD-ROM: NTSC standard definition (SD) DVD video player for TV, or computer. Approximate length 30 mins, in 16:9 widescreen format, also playable on a 4:3 regular screen, or any good computer screen (800 x 600 resolution, or better). Furthermore available in PAL DVD video, in streamed digital, and Apple Video iPod formats. The HD (high-definition NTSC and PAL) formats are also available as soon as the HD DVD standard is finalized and players are available. Please visit on the web www.cimwareukandusa.com for available formats, and further relating titles & products.